“What makes Aldi’s olive oil so good?” In case you were wondering, Aldi gives you the answer in one of its latest ads. The 30-second spot, titled “Child Seat,” opens with a guy raising this question while looking at a bottle of olive oil, in an Aldi supermarket. His mother, who’s with him, tells him that’s because “only the specialist, most amazing products in all the world make it in all these stores.” “Something so beautiful and precious you should never ever ever ever ever let go,” she adds looking at him, while he’s busy looking into his phone. At this point, it turns out the guy is sitting in the child seat in the shopping cart. Without looking back at her, but still into his phone, he comes with a suggestion – “Geez, mom, it’s just olive oil, stop being weird!” he says, which makes the woman being even weirder and caress his head as if he was 2-years old. 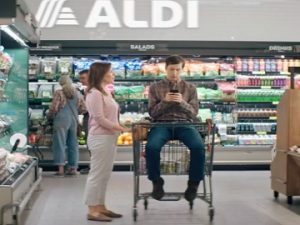 The commercial ends with the voiceover informing that Aldi handpick only the most amazing products and adding “That’s changing shopping for the better.” and the chain’s tagline, “Aldi. Shop differentli”. Other spots recently launched also highlight the same idea, that only the best products make it to Aldi’s shelves. Fresh, never frozen fish and meat, produce delivered daily, exclusive wines, baby foods, and an extensive line of organic, gluten-free, and vegan foods, as well the significant number of awards and recognitions, and the chain’s Twice As Nice Guarantee are the highlights of the other five ads released by Aldi. Aldi is known for advertising its own brands, of which it says are “made of the same, or even higher, quality than national brands” and are backed by the chain’s Double Guarantee. Switching to ALDI-exclusive brands saves you up to 50% over national brands on the things you buy the most, according to the retailer, which explains to its customers that a typical ALDI store stays open during the most popular shopping hours and that staying open later would simply add labor costs and raise its prices.